Why Visit An Event Taking Place In…Tokyo? Home>All News>Why Visit An Event Taking Place In…Tokyo? 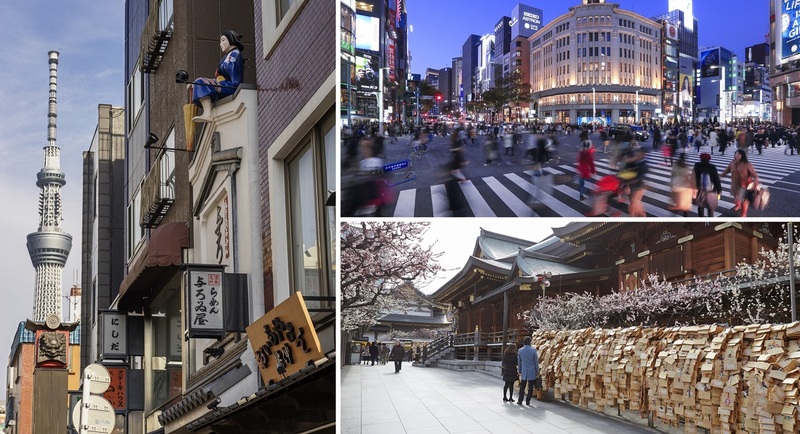 Come to Tokyo and discover a marvellous mixture of tradition and innovation. Cruise down the Sumida River, passing under 17th-century bridges, then take the speedy elevators up to the tallest and newest landmark, TOKYO SKYTREE®. 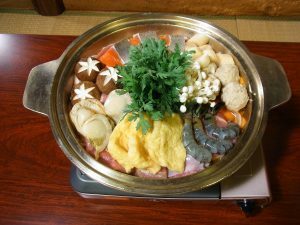 No city in the world has earned more Michelin stars, and there are over 80,000 restaurants, cafés and bars around town. Tokyo has 10,000 parks and gardens, and 98,000 hotel guest rooms, from luxury accommodations to budget bookings. As the business centre and leader of Asia, Japan’s capital delivers quality and success beyond expectations.
" Cruise down the Sumida River through central Tokyo, passing under 17th-century bridges. Take speedy elevators up the tallest landmark, TOKYO SKYTREE®, and take in the landscape. Wake up at the crack of dawn for the auction at the world’s busiest fish market, down the road from the theatre for ancient kabuki.	" Visiting Tokyo is an exciting adventure, full of beautiful and impressive architecture, such as neon-lit skyscrapers and traditional temples. With over 35 million people living in the greater Tokyo area, the city is run smoothly with its organised, modern transport network. With a peerless public transportation network and an increasing number of multilingual signage, getting around Tokyo is stress-free. With a JR Rail Pass or travel card, you can navigate stations, hop on and off buses and even take waterbuses with ease. Travelling overground, underground, at slow-speed or ultra-fast-speed are all available in the city. The streets are crowded with taxis—many with English signage—and a vast network of buses criss-cross the city. Central Tokyo itself is relatively small meaning renting a bicycle is a practical and fun way to get to places. 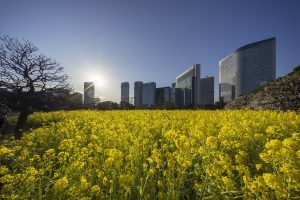 As a business capital, Tokyo constantly welcomes government dignitaries and business leaders, offering the highest quality of service and organisation. The 98,000 guest rooms in Tokyo offer a wide choice of accommodation, from budget to luxury international brands. A variety of multi-purpose venues can fulfil the specific needs of everyone coming to the city. Tokyo is a vibrant city that is sure to stimulate the minds of children. It is also a sprawling metropolis that can be overwhelming and exhausting. Planning ahead is key to a successful trip with children. Schedule in a mix of activities, appropriate restaurants, and plenty of time to rest, as the jet lag can be particularly tough on young kids. If you are travelling with very young children, make use of the designated priority seating on the trains. Most stations will have bathrooms with plenty of space, diaper changing tables and sometimes hot water that you can use for formula milk. In the bigger shopping complexes, you can often find stroller rental, as well as designated play zones for young children to stretch their legs. For eating out with older ones, family restaurants are a good choice as they have a very wide menu, meaning you are guaranteed to find something for everybody. If you want the children to experience new tastes without ordering them in a restaurant, take them to the basement floors of a department store. This is where the food hall is located, and there are often chances to taste what’s on sale. 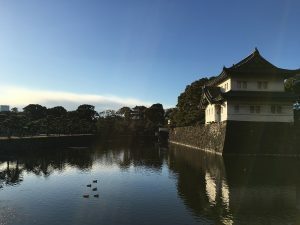 If the weather is good, Tokyo’s many parks and gardens are a great place for kids to blow off steam, however, make sure to plan some rainy-day activities too. Many museums have interactive elements for children to enjoy, and the city’s aquariums, cinemas, and other entertainment complexes are a good choice. For an activity that only costs as much as the travel fare, head to the very front carriage of the train, as you can often see out of the front. 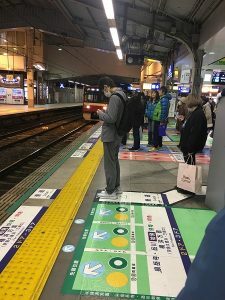 Children—and adults as well—can enjoy rolling on Tokyo’s train tracks as if they were driving the train.